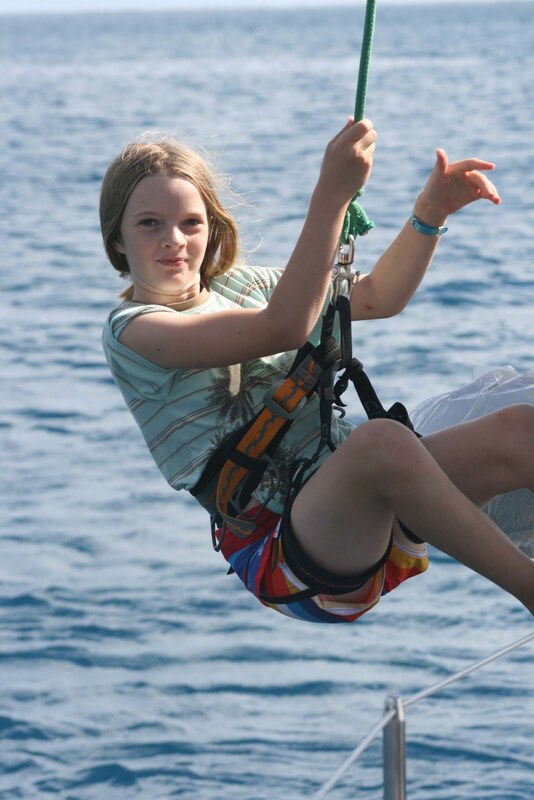 It all began when we met the four kids on Pickles who were swinging off the side of their boat. They were hooked to spinnaker and jib halyards, and they wore a climbing harness around their waist. Soon Kai and I were swinging too! Pickles got us hooked on it (Uncle Ethan no pun intended!). And luckily my Aunt Tilly came to visit us this month and she brought us four harnesses, two for us, and two for our friends, Patrick and Thomas on Victoria, who Pickles also introduced to swinging. Thank you Tilly! The basic idea is that the line, technically called a halyard, runs to the top of the mast, allowing you to swing from bow to stern. It is possible to swing all the way to the other side of the boat, and swing with another person. 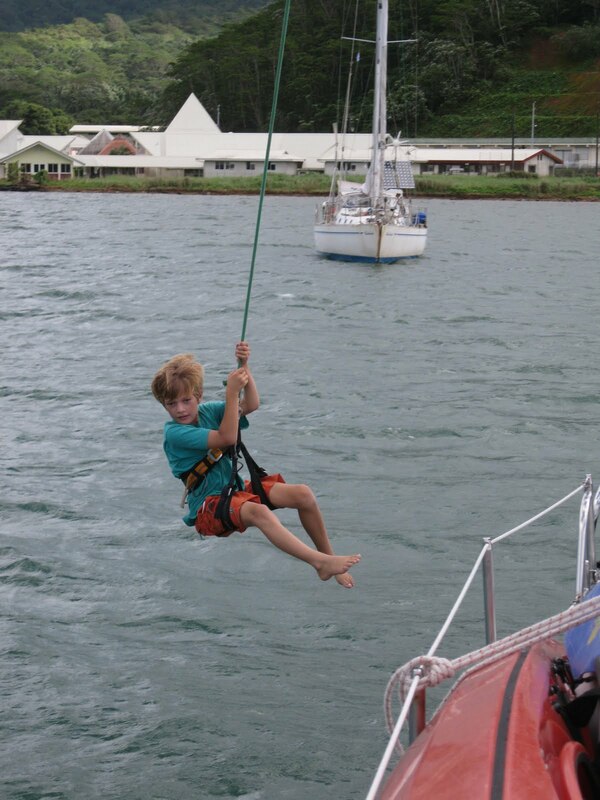 We use spinnaker halyards, to make long runs. The harness itself is a normal climbing harness, with two leg holes and another strap for the waist. There are holds on the side to clip things to and a sturdy sort of fabric where the halyard clips. The possibilities for swinging are endless. Sometimes I go upside down, sometimes I swing over the bow, and sometimes I leap from side to side. Kai and I are making up various moves all the time. While swinging, I feel weightless, maybe like the astronauts do in outer space. For some reason I can always tell where to push to aim the right direction. In a sense, I’ve become a pendulum! Often I warm up with a flip, then go for a push off the stanchion closest to the stern which Kai and I have named, “Baby.” From there I go to a spot where I can push off the winch and lifelines, called “Windows.” Then we jump from a bar on the dodger. And finally we go off the davits. From the davits it’s possible to go over the bow. That is by far the most exciting. 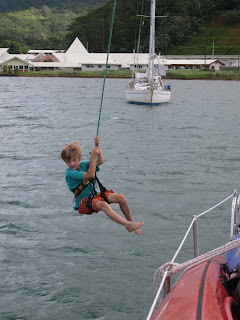 Halyard swinging is a lot of fun. It’s not only fun, it’s my new sport! Your mast swing sounds like lots of fun, Maya, but I started worrying a bit about it. Maybe you can put my mind at rest. When you push off from one part of the boat you're sailing out and around the boat. Isn't it possible to bonk yourself against something hard like the dodger supports or even the mast if you're not paying attention or have your feet swinging out away from the boat when gravity pulls you back toward the boat. Seems to me like it might be easy to get a bump. In which issue of "Lattitudes" will your story appear? sometimes we swing into the hull, or the lifelines. the portholes on the side are easy to hit, but it's impossible to hit the mast or dodger. It sounds like a lot of danger, but really once you get used to them it's easy- enough. we still sometimes hit. mostly it's scrapes on the leg or bruises, so it doesn't hurt. there's this lady on another boat who's 70, and she swung on the halyards. surely you could too! I don't know which issue it will be coming in, but i'll let you know as soon as possible. Come sail with us as we head south from San Francisco to Mexico and beyond.